Aftermath of the Tulsa Riot that destroyed the homes and businesses in the black community of Greenwood, killing more than 100. An outbreak of communal violence is an ugly thing. We shouldn’t think first of the mindless behavior of hometown fans when their team wins the final game. Nor should we think first of the violence that rocks nations when oppressed communities respond to state violence with outrage. We need to think about lynchings: the angry, outraged mobs that insist on immediate vengeance for some fundamental violation of communal norms. And we need to think about our stories, not what’s happening in some other country. Emmett Till was 14, visiting from Chicago, when he encountered 21-year-old Carolyn Bryant at the small country store she owned with her husband in Money, Mississippi. He may have whistled at her; he may have whistled to his friends; he may have whistled softly to himself as he had been taught in order to control his stuttering. He was taken from the home where he was staying with his great-uncle in the middle of the night by Carolyn’s husband and his half-brother. Emmett’s naked, shot, and brutally beaten body was fished from the Tallahatchie River three days later, barbed wire wrapped around his neck and attached to a weight. What happened to Stephen in Acts 2 is this same kind of outbreak of communal violence. A mob outraged by his claim to see Jesus at the right hand of God rose up in violent revenge. It happened repeatedly to the apostle Paul – indeed Paul participated in the murder of Stephen and was dedicated to arresting followers of Jesus when the risen Jesus appeared to him on the road to Damascus. The arrest that led to Paul’s eventual execution in Rome followed a riot begun with a rumor that he had desecrated the Jerusalem temple by bringing a gentile into the inner court. Communal violence is an ugly thing. The crucifixion of Jesus was a deliberate act of the governing families in Jerusalem allied with the Roman imperium. It was an act of state violence. But what happened to Jesus in Nazareth after his sermon was a more visceral outbreak of rage. We paint pictures of Jesus with children and lambs and it takes some work to understand what part of his message was so offensive his hearers rose in fury to kill him. Jesus is uppity, acting out of his station in life. Jesus calls the people on their implicit rejection of his ministry – and then he dares to say that God’s reign is not for Israel but for all people. The people assert his obligation is to care for his family and village, but Jesus points to Elijah and Elisha who dispensed God’s favors to a poor widow and an afflicted leper among Israel’s enemies. This is what leads to rage, to the ugliness of communal violence. Jesus might as well have whistled at a white woman. It is deep within us, this conviction God should care for us more than others. Donald Trump milked and manipulated it into the presidency. It took Jesus to the cross. But in the empty tomb God declared Jesus the one who speaks the truth. So Sunday we will hear about Jeremiah’s prophetic call and God’s command he should speak fearlessly. The psalmist will declare God is his rock and his fortress. Corinthians will speak to us about the ultimate importance of love – not romantic love, but fidelity and care for all people. And then comes the abortive attempt on Jesus’ life. They will not get him this day; they will not get him in the end, for we follow one whose love is not silenced by hate. The children were given binoculars on Sunday – as we look on this Sunday to the horizon of history. The theme for the day was “A Journey towards God,” and the texts for Sunday can be found with the post: “The season of hope.” These are a few passages from the day’s sermon. The full message can be found here. When we describe this first Sunday in Advent as being about our Journey towards God, we aren’t just talking about my individual spiritual journey, but the journey of the whole world to its re-creation. We are moving towards a creation made new. We are moving towards the day when the Spirit of God reigns in every heart. This means we are fundamentally and profoundly people of hope. We don’t look on the sorrows of the world around us with despair. We don’t lay our dead in the ground imagining this is the end. We don’t see the triumph of lies and deceptions and hate as the end of civilization. It may be the end of our civilization, but it is not the end of God’s work with the world. It’s not the end of the human story. What is present to us in Jesus is a new birth of the world. And the followers of Jesus are the messengers of Jesus carrying that new birth to the world. We are not waiting with dark pleasure at the thought that the wicked are finally going to get their due. We are rejoicing in the rebirth and transformation of the world. We are sowing the seeds of mercy and light. We are living our reconciliation. We are bearing witness to the mercy of God. We are bold in the face of death, for death has lost its sting. We belong to God. The world belongs to God. And we are headed toward life. Even if it were possible for heaven and earth to pass away, says Jesus, his promise will not pass away. The shaking of the powers of the heavens doesn’t mean literal changes to the physical universe – the reference is to the governing powers that oppress human life. The powers that are shaken are hate and fear and racism. The powers that are shaken are tribalism, greed and falsehood. The powers that are shaken are all the tyrants that rule – because a new king is coming: one who reigns in justice and righteousness, one who fills all creation with faithfulness to God and one another, one who sets right the world. 15“Truly I tell you, whoever does not receive the kingdom of God as a little child will never enter it.” 16And he took them up in his arms, laid his hands on them, and blessed them. “This is the best day ever!” she said emphatically and repeatedly at the end of our day today. Worship had been followed by the “Hanging of the Greens” as we set up and decorated the Christmas trees in the sanctuary, a “family” Christmas tree in the entryway (with ornaments from every family), and decorated the campus of the church with large ornaments hanging from the trees. At the children’s sermon they had come forward and stood before a large mural of Mary and Joseph journeying towards Bethlehem, and discovered that it was a large Advent calendar. It’s only December 2nd, so there were only two doors to open, but the second contained a gift for the children – small binoculars because on this first Sunday in Advent we look towards the horizon of human history and a world made new, when Christ reigns in every heart. I’m not sure they got the message. They were too excited looking for the numbers and getting the packages open to use their binoculars. Their joy and enthusiasm is a healing balm and delight for a congregation. Children have the very important ministry among us of being children – even the sad child who came to the altar rail at communion with tear stained cheeks. I don’t know the source of distress, but I appreciated the child’s sad and yearning look into my eyes as I placed my hand and gave a blessing. We all need to feel the hand of blessing at times. So Advent is come. Christmas draws near, but this is the season of waiting and hope, of expectation and joy. For the child of the manger is the one who comes at the fulfillment of the human story, and his hand is a hand of blessing. “Is Jesus a monster?” she asked with the rising inflection that indicates both surprise and a struggle to understand. I had brought to the children’s sermon an icon of Jesus and asked them who it was. When we settled on Jesus, one little boy announced “Jesus is dead.” I answered “Yes, Jesus died, but God made Jesus alive again.” When he then asked if Jesus would die again, I said “No, God made Jesus alive in a way that would never die.” That’s when the eyes of the little girl grew puzzled as she confronted the thought that Jesus was a zombie. I hadn’t intended to talk about the resurrection. Last Sunday was the final Sunday of the church year celebrated in our tradition as Christ the King. 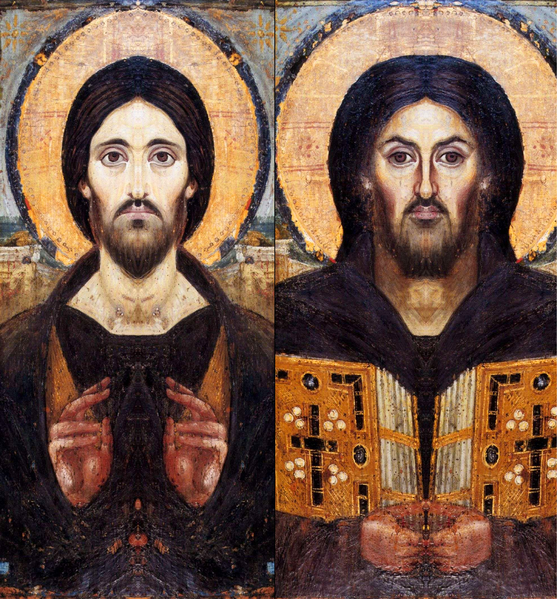 I was showing the children a famous icon of Jesus where one half of his face doesn’t match the other. Two faces have been painted together. It has an interesting effect as you look at it. You see one face, but it gives you this strange experience that there is more here. And so it is with Jesus. He is fully and completely human, yet we sense there is more here. The face of God is present here with this human face. The hands of God with these human hands. The voice of God in these human words. All I wanted to talk about was that sense of something more in Jesus. Something of God comes to us in him. But then the little boy said Jesus was dead, and now we were speaking of an even greater mystery than the incarnation. Now it is Easter without the bunnies and flowers. Now it was just the raw, unvarnished mystery that he who died is not dead, and the promise that we too shall live in God. Hard concepts for children. Even harder for adults. I tried to rescue the conversation by talking about how much they love their parents and their parents love them. Their parents would never want to be separated from them. In the same way God loves us so much that God never wants to be separated from us. It’s a mystery how this happens, but the love of God is sure. I don’t know whether it worked. But I tried. Sunday gives us the famous Biblical verse composed of two words: “Jesus wept” – though for some reason I cannot understand our translation changes it from its simple aspect to a continuous one: “Jesus began to weep.” Perhaps that decision was driven by the context, but I hate to mess with the Biblical text. And there is something true and important about a more timeless recognition that Jesus wept. Jesus knows tears. He does not walk above the sorrows of the world but in them. Whatever theological points we wish to make about him as the incarnation of the divine, he shares our humanity. He wept. Isaiah will also speak to us about tears. We will hear of the banquet God will prepare “for all peoples” when death is swallowed up and God “will wipe away the tears from all faces.” And John of Revelation will convey to us the vision of “a new heaven and a new earth,” when “death will be no more,” and we are released from all “mourning and crying and pain”. These are appropriate texts for the day we remember those who have gone before us, who wait with us for that day when the graves give back their dead and the world rises into the fullness of life. And these texts are full of grace for us in days when we see too many tears and wonder what future awaits us. We live by a promise that God’s work is to heal the world: to unite what is divided, to build up what is torn down, to free what is bound, to open eyes that do not see, to grant us hearts of flesh not stone, to call us to come forth from the dominion of death into the realm of grace and life. that in you we should find that life that shall not perish. we might live now in the joy of the banquet to come. “On this mountain the Lord of hosts will make for all peoples a feast of rich food, a feast of well-aged wines, of rich food filled with marrow, of well-aged wines strained clear.” – The prophet announces to a war torn people that God shall gather all nations to one table and wipe away every tear. “Lift up your heads, O gates! and be lifted up, O ancient doors! that the King of glory may come in.” – Words from an ancient liturgy in which God is received as king, perhaps when the Ark of the Covenant is brought to the temple. “And I saw the holy city, the new Jerusalem, coming down out of heaven from God, prepared as a bride adorned for her husband.” – John of Patmos reaches his great concluding vision of a world restored to God, where the heavenly counterpart to the earthly city of Jerusalem comes to earth and God dwells among us in a world made new. “Jesus said to her, ‘I am the resurrection and the life. Those who believe in me, even though they die, will live, and everyone who lives and believes in me will never die.’” – Jesus comes to raise Lazarus from the grave. “One of the scribes came near and heard them disputing with one another, and seeing that he answered them well, he asked him, “Which commandment is the first of all?” – When asked which commandment governs all the rest, Jesus cites Deuteronomy and Leviticus – to love God with all our heart and soul and strength, and to love our neighbor as ourselves. Follow these links for other posts on All Saints or All Saints in year B.